I hope your 2018 resolution wasn’t “Make no mistakes in crosswords this year.” Imagine the poor soul who was so close to accomplishing that feat ending the year with this one. 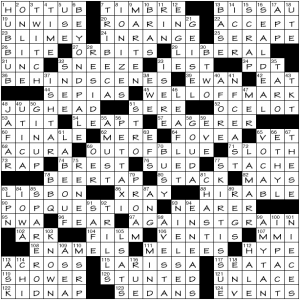 Best to start the list with 122-Across: [Evidence of dropping the ball, as found in the starred clues and in 12 crossings in this puzzle] ERRORS. With that in mind, the solver needs to insert two letters for 12 crossings that incorrectly correspond with the clues. 21D/25A [*”Pride or Prejudice” author Austen/*Groups calling stripes] JANE / UNIONS. Wait… this time answers are correct, but there are typos in the clues (“Pride and Prejudice” / Groups calling strikes). 45D/44A [*Prominent feature of one with six-pack abs/*Longest word in RSVP] PAUNCH / SIL. For a second, I thought this qualified me as having six-pack abs. Nope. Opposite and an inaccuracy. 58D/78A [*Browse bestbuy.gov, say/*Landlocked European country] SHOP / CH AD. Incorrect clues. Bestbuy.gov is not a functional site- though it sounds like a bribery scandal waiting to happen. 91D/110A [*”___ no Ted” / *Unbundled, as hay] DULY / BALED. Oddball typo (Duly noted) meets an opposite. 121D/138A [*Modern form of “you”/*Repair, as shocks] THEE / DARN. Opposite and a typo (socks). 112D/126A [*Highest temperature projections/*Canine foaming at the mouth with rubies] LOWS / MAD DOG. Opposite and a typo (rabies). 73D/105A [*Southpaw/*Toothless tool] RIGHTY / SAW. Opposite and an inaccuracy. 71D/71A [*Dec. 30 et al./*Knitting tread] EVES / YARN. Typos. (Dec. 31 / thread). Is yarn considered thread? I never equated the two. 40D/38A [*Feels healthy/*Bern perfume, as at church] AILS / CENSE. Opposite and a typo (burn). 5D/23A [*Spreads out, as a flag/*Eschews food] FURLS / EATS. Two opposites. The resulting phrases read HAPPY NEW YEAR for the down clues and AULD LANG SYNE for the across. Whew. Just typing that up was exhausting. This last WaPo puzzle of 2018 is bound to frustrate a number of solvers. I want to preface my review by saying that I truly appreciate that Evan is willing to take huge risks, which is why I always look forward to solving his constructions. The most memorable puzzles I’ve solved this year came with either Gaffney or Birnholz as the surname in the byline. That being said, it didn’t quite feel like this puzzle knew what it wanted to be, and from this solver’s standpoint, it wasn’t all that fun to figure out. Was I to insert opposites? Was the clue wrong? Or was the answer wrong? I didn’t even notice several typos in the clues until typing them just now (“Pride or Prejudice,” “Downtown Abbey,” Dec. 30 et. al. to name a few). While I think that the inconsistency in the cluing was the whole purpose, I found myself simply skipping over starred clues. When a puzzle’s theme doesn’t assist me in solving the puzzle and I gravitate toward the standard fill instead, I have a tendency to lose interest. 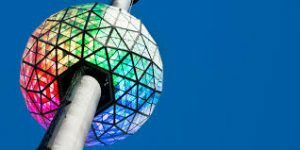 Also, besides the phrase DROPPING THE BALL being related to the Times Square ball drop in a tongue-in-cheek way, I’m not sure what HAPPY NEW YEAR / AULD LANG SYNE have to do with all of the errors. Had I not read the note that we were to uncover two different phrases, I can’t even be certain that I would’ve figured out that there were rebus squares at all. Anyway, while I’m not in love with this puzzle, I am very much looking forward to what Evan has in store for 2019. Keep ’em coming, Birnholz! Your risk-taking is yielding seriously high payoffs… and it’s bound to come with a few that raise an eyebrow. I feel like this one was asking a bit too much of the solver. 4 star risk-taking with a 2 star solve experience puts it at 3 stars for me. 61D [“Last Battle” publisher] SEGA. Wherein phrases have shed their internal definite article to set up wackified new interpretations. I like the gimmick better than the title. “Duh” for “the” is a bit too exaggerated an accent for me. Are we calling it old-timey Brooklynese, perhaps? 36a [Reason for an R rating] BEHIND SCENES (behind the scenes). 45a [Cuban or Zuckerberg?] WELL-OFF MARK (well off the mark). 69a [Needing certain ink for a color printer?] OUT OF BLUE (out of the blue). 90a [Impetus behind a paternity test?] POP QUESTION (pop the question). 97a [On a Paleo diet, say?] AGAINST GRAIN (against the grain). Paleo is capitalized here? 16d [Buy one circus animal, get one circus animal free?] SEAL DEAL (seal the deal). I will never stop correcting the erroneous notion that seals are (or were, as many circuses are sensibly moving away from non-human attractions) a common fixture of circuses when in fact those are sea lions. 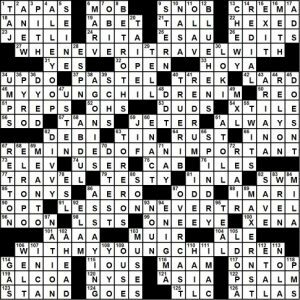 Perhaps an argument could be made for common parlance, but I’d nix that in a crossword also featuring 52a [Largest species of the genus Leopardus] OCELOT (incidentally, that needs to be italicized). On the other-other hand, we see 71a [Epitome of laziness] SLOTH. Bah. 77d [Installment of a women’s clothing catalog?] SKIRT ISSUE (skirt the issue). I’m … uhm … choosing not to get into a discussion of gendered apparel at this time. 85d [Something up for grabs on a fishing boat?] SPARE ROD (spare the rod [, spoil the child]). Not discussing corporeal punishment either. Some of these are both clever and amusing. 13a [West African capital] BISSAU, capital of—you guessed it!—Guinea-Bissau. A more interesting factette is found in 83a [Only European capital on both a river and an ocean] LISBON (Tagus, Atlantic; Portugal). 29a [Hardly a right-minded individual?] LIBERAL. That question mark is taking on quite a load. 96a [“The path to the dark side,” per Yoda] FEAR. Or is it hate, or anger, or all of them? I’ll let you folks sort that out. 115a [Capital of Thessaly] LARISSA. 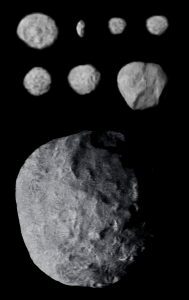 Named for a nymph and lover of Poseidon, hence why it’s also the namesake of one of the many moons of Neptune. 27a [Goes around] ORBITS. 122a [Shanghai] KIDNAP. Not listed as offensive in either m-w or American Heritage. Unlike some other words. Possibly because it’s a place name rather than primarily the name of a people? 4d [Something you might need to kill] TIME. 9d [Weasel’s relative] MARTEN. There are a few species in the genus Martes. 30d [Stealth bomber, familiarly] B TWO. Er, I’m invoking Fiendblog Standard Complaint number 59200-stroke-5. 51d [2017 World Series winner, for short] ’STRO. See also 77a [It may be right under your nose, informally] ’STACHE. 65d [Some SAT study] VOCAB, no ‘familiarly’ or ‘informally’ qualifier here? More concerning, though: 105d [Exams for future J.D.s] LSATS (though it’s only the T that stands for the same word: Scholastic Aptitude/Assessment Test and Law School Admission Test). 68a [Maker of the MDX and luxury S.U.V.] ACURA; 18d [Sport-__ ] UTE; 123a [Accents and Sonatas] SEDANS. 3d [Reaction to a really bad pun] TWITCH. I like that image. Restrained, yet judgmental. So I guess this is a good spot to end the write-up. Wordplay, how I love thee. This is a fun theme. The title can be read as “Calling For Th” – each theme answer has a TH in place of an S. Lisping wackiness results. 23a [Off-season at a nudist camp?] is CLOTHING TIME (closing time). 28a [Dollhouse Christmas decoration?] is PEE-WEE WREATH (PeeWee Reese). 43a [Defrost in the microwave?] is POWER THAW (power saw). 51a [Two, for most folks?] is THUMB TOTAL (sum total). 68a [Aha moment sensation?] is THINKING FEELING (sinking feeling, which sounds more natural preceded by that). 89a [Geek chic?] is MATH APPEAL (mass appeal). 98a [Underwear catalog?] is a THONG BOOK (song book). 111a [Cinderella’s coach?] is a MYTH CARRIAGE (miscarriage). 122a [Suffering from stress-related weight gain?] is WORRIED THICK (worried sick). The theme is consistent, all the base phrases are in the language, and some of them made me giggle (especially THONG BOOK. Those of you with teenage daughters will understand). 5d [Duds, old-style] is RAIMENTS. I always thought RAIMENT covered all the clothing and would never have used it as a plural. I can’t be the only one who initially misspelled BRIER at 11d, [Pipe material]. BRIAR PIPE is more common, with ~ 4,900,000 Google hits compared to 163,000 for BRIER PIPE, and the Ngram viewer tells the same story. I think this one should have had a (var) added. 47d [Common sense] is one of the five, SMELL. Nice misdirect. 52d [Obscure] is the verb, not the noun, so we get the musty BEDIM. 100d [They may empty in a brawl] are BENCHES. 46 days until pitchers and catchers report. 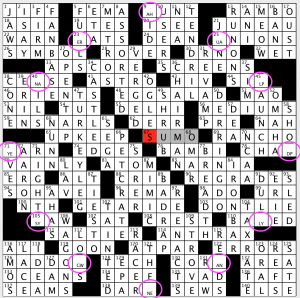 I like quip crosswords. but this one struck me as meh. It took me about 20 minutes to solve. I started doing it by hand and then switched to the puz file. I zipped through the upper third, using vertical clues only, paying no attention to the quotation. As I watched ANILE appear, from childhood I recalled this word as discriminatory, subjective, and negative all at once. It’s still in my word list, but it’s scored very low. Best I can tell, it’s not been in the NYT in 18 years. 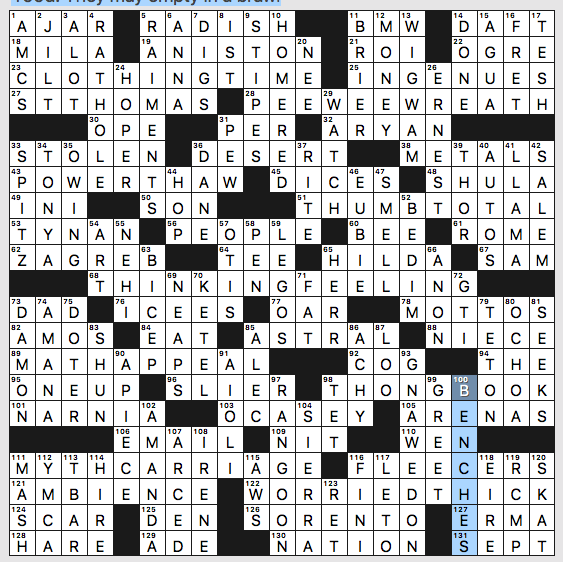 It’s been in the LAT syndicated puzzle five times since 2000, but not since 2013. The typical clue for it is [Old-womanish], which BEQ used, though [Doddering] has dominated for the past decade. In any event, I say strike ANILE from word lists, and I’ve now done so. Being in the upper left, it gives a bad first impression. I ran a few quick trials of that upper left area, leaving ALLEY OOP in place (nice clue for it, btw, [Basketball pass]–dictionaries say the term refers both to the overall play and to the pass that enables the play where a leaping player receives a highly-arced lob and dunks the ball all in one motion), and feel pretty comfortable in saying that a fill of equal or higher quality is available without resort to ANILE. 117a [Winning] ON TOP–This prints out pretty close to 102d, AHEAD, which could have been clued identically, but wasn’t. 12d [University of Delaware athletes] BLUE HENS–As a progressive, feminist-oriented male, I love the concept of men athletes competing as hens. I wonder, though, how my female counterparts feel about a standard phrase in the U. Del. athletics web pages for women’s sports, “Meet the Hens”? 41d [“The Shining” chant] RED RUM–which, of course, is MURDER spelled backwards. 45d [“Almost ___ count”] DOESN’T–This reminds me of the words of so many high school and junior high school coaches, who spoke these words as though they came from some holy text. 65d [Laundry cycle] SPIN–DRY–I wonder if anyone has ever before raised a nit about this entry in crosswords. I cannot remember ever seeing this exact lingo on an appliance. My washer has the notation “Rinse+Spin.” My dryer has the phrase “Time Dry,” though, of course, it does spin the clothes. Merriam-Webster carries spin-dry only as a verb, meaning “to partly dry (washed clothes) in a machine (called a spin-dryer) that spins them very fast” (yup, they split the infinitive and they use the word very). Oxford‘s treatment of the same word goes like this: “Extract water from (washed clothes) using a machine that spins them in a revolving perforated drum.” Oh, forget it! 89d [“L’Ange du Foyer” surrealist] MAX ERNST–Good fresh clue for a nice 8-letter ILSA! 112d [there are other names as well] ET AL.–Good fresh clue for a standard 4-letter ILSA. This was a reasonably fun crossword, considering that I did not react positively to the quotation on which it is based. 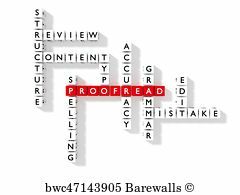 It has, I think, too much duplication, what with the word travel appearing three times and some of the other words appearing twice. That’s the kind of humor that works better vocally than it does in writing. Not sure whether that makes it dry, wry, or both. This entry was posted in Daily Puzzles and tagged Evan Birnholz, Gary Larson, Luke Vaughn. Bookmark the permalink. It is Ask Me Another but of course there’s a more recognizable AMA & this answer should be some sort of abbreviation, using the logic that justifies VOCAB. There’s so much trash strewn all over this puzzle, though, that I need to get away. If only I could drive from LARISSA to BISSAU in my Sport-UTE, with my AVESTA in tow for some reading if I didn’t feel like taking in an R-rated movie with some BEHIND SCENES. Ambiguity is an essential part of crossword cluing. Hence, for example, ‘flower’ can indicate a river or a thing with petals. “A.M.A.” as per the clue is obviously an abbreviation, and the ‘ASK me anything’ sense is quite common these days. What logic suggests that the answer to [Part of A.M.A.] should also be an abbreviation? Agreed with the reviewer on WaPo. Wasn’t sure of what the puzzle was supposed to be or what to do with what I was seeing. Risks come with failures and great successes and this was one of the failures. I definitely appreciate seeing what Birnholz comes up with in 2019. Sorry if the click wasn’t there. I’m beginning to think “Dropping the Ball” may have been a more apt title/solving experience than I had bargained for. My first New Years resolution is to make sure every puzzle clicks home better than this. WaPo – Hey, Evan. Don’t change a thing! I really look forward to your puzzles and like them just the way they are. Thanks for a fun 2018, and can’t wait to see how you challenge us in 2019. Cheers. I thought it was a fine puzzle. My only gripe was figuring out which letter to place first. Keep up the good work. I figured it out but it was tougher than usual. The main problem was that I didn’t see any rhyme or reason to which letter should go first/second in the ambiguous crossings, so that I ended up with a seemingly random string of doubles from which I was able to untangle the desired phrases. Jim Q’s review here makes it somewhat clearer, but I still think that getting to the solution(s) was harder than it should have been. But I agree with everyone else: your puzzles are always imaginative and engaging, so keep ’em coming! 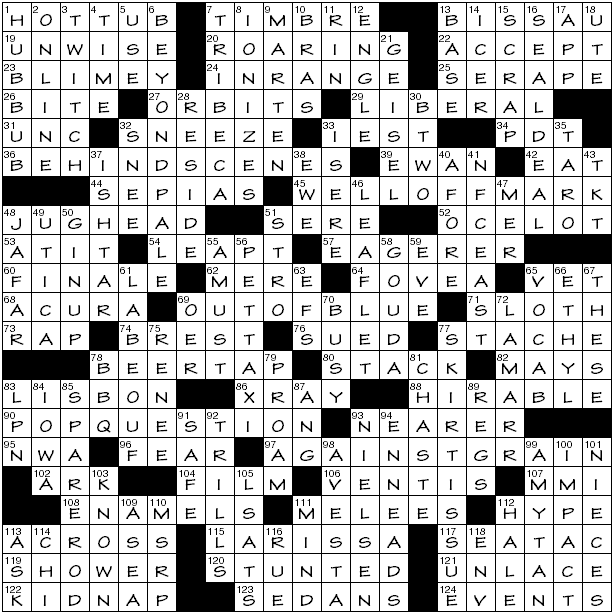 WaPo: Also note the Evan Birnholz trademark “no nonsense in the grid”: for every single pair of starred clues, if you write in either one of the two letters into the grid, you get legitimate grid entries for both words. So for example, HIDE/AUNT cross at their first letters, and AIDE and HUNT are legitimate words too. I might agree that this particular WaPo fell a bit into the “more impressive than fun” category, but it was still pretty fun. Really liked the NYT. A classic Sunday type theme, consistently executed. Two 3 letters were my bane. ASK and RUE. Got ASK worked through acrosses but didn’t know Larissa. Regarding the question about DUH replacing THE. What about Da Bears or maybe its Duh Bears? One of the hardest things about trying to construct a Sunday puzzle is coming up with a title that relates to the theme. I really don’t get how you can substitute “duh” for “the”. Seems like a total deal killer, surprised this one was accepted. The rebus squares in Evan’s puzzle are also at the positions of the 12 clock numerals, FWIW. I’m a themeless fan in general, but this was certainly impressive. WaPo: too clever by half. Having read the review, I still don’t get it. NYT: Horrible double natick with LARISSA crossing both RUE (as clued) and AVESTA. Could have been helped by at least clueing RUE as “regret” or some such. Surprised the reviewer didn’t mention it. Seemed quite obvious to me that –UE for a plant was RUE, and then that LARI–SA seemed likely to be LARISSA. Perhaps that was subconsciously reinforced by the double-s sibilance of Thessaly. AVESTA wasn’t familiar but as I said the S seemed ordained. I agree that RUE shouldn’t be a problem for experienced solvers, but I wouldn’t say the other cross had to be S. T seems possible, perhaps also A, I, or O. Maybe even N. Or Z, at a stretch. I actually knew AVESTA, inexplicably, but I thought the cross might trip up quite a few people. I’ve done a good amount of puzzles and can’t see how you figure. Why? Many letters seemed possible to me. I liked the NYT. I agree with Pannonica that many of the theme answers were clever and amusing, but that title! It just didn’t work for me. Maybe, Off THE Chart? I’m sure someone can think of something better. LAT – Having gotten BR, I misspelled BRIER as BRASS. LAT – Hey, Jenni. I initially entered 11D as BRIAR, too. Good to know I wasn’t the only one. Don’t recall ever seeing it spelled BRIER.